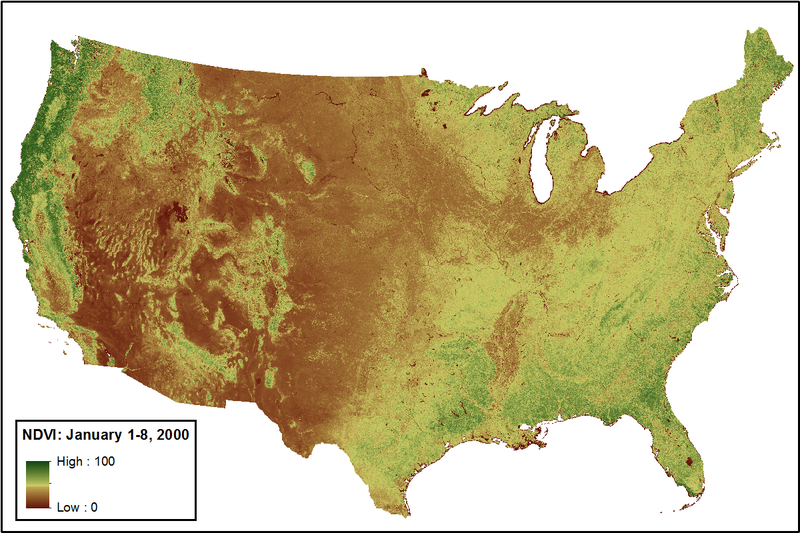 This data set provides Moderate Resolution Imaging Spectroradiometer (MODIS) normalized difference vegetation index (NDVI) data, smoothed and gap-filled, for the conterminous US for the period 2000-01-01 through 2015-12-31. The data were generated using the NASA Stennis Time Series Product Tool (TSPT) to generate NDVI data streams from the Terra satellite (MODIS MOD13Q1 product) and Aqua satellite (MODIS MYD13Q1 product) instruments. TSPT produces NDVI data that are less affected by clouds and bad pixels. There are 16 files (16 years) of Collection 5 MODIS NDVI data products with this data set in netCDF 4 (.nc4) format. Figure 1. Smoothed and gap-filled NDVI for the conterminous US for the period January 1-8, 2000. NDVI is expressed as percent in this figure. This data set provides Collection 5 MODIS NDVI data, smoothed and gap-filled, for the conterminous US for the period 2000-01-01 through 2015-12-31. The data were generated using the NASA Stennis Time Series Product Tool (TSPT) to generate NDVI data streams from the Terra and Aqua MODIS instruments. TSPT produces NDVI data that are less affected by clouds and bad pixels. The TSPT is a MATLAB-based software application that computes and displays high-quality vegetation and environmental monitoring indices from high temporal revisit rate MODIS and other satellite sensors (McKellip et al., 2014; Prados et al., 2006). After TSPT was used, additional temporal processing was performed using another NASA Stennis MATLAB application known as the Phenological Parameters Estimation Tool (PPET) (McKellip et al., 2010). The MOD13Q1 and MYD13Q1 products were obtained from the NASA EOSDIS Land Processes Distributed Active Archive Center ( LPDAAC) USGS/Earth Resources Observation and Science (EROS) Center, Sioux Falls, South Dakota, [https://lpdaac.usgs.gov/tools/data_access ]. There are 16 data files in netCDF format (.nc4), one for each year, for the years 2000-2015. These are 8-day time series MODIS NDVI data, with the first date beginning January 1 of each year, and the last beginning December 27 (the last interval extends into the following year). There are 46 time intervals in each year. For example, for the year 2011, the first interval is Jan 1 - Jan 8, 2011 and the last interval is Dec 27, 2011 - Jan 4, 2012.
unaccum= denotes that a process was applied to remove the contributory effect of the previous periods’ NDVI value from the current period’s NDVI values in the effort to isolate only the NDVI contribution for the current period. This highly polished phenology data set, complete for the 2000-2014 period, is used to generate phenoregions nationally, and is also used to support the ongoing products from the national ForWarn forest disturbance monitoring and tracking system. More info on ForWarn can be found at http://forwarn.forestthreats.org, and the ForWarn Forest Change Assessment Viewer (FCAV2) is available at http://forwarn.forestthreats.org/fcav2. TSPT eliminates outlier data having greater than a user-defined deviation from prior values, and then fills data gaps by interpolating temporally between bookend observations. The smoothed, gap-filled data set that results is nearly complete, with few missing values, and is ideal for many phenological analyses and applications. These data are ostensibly less affected by clouds and bad values than the standard MODIS products, although it is difficult to assess this other than by improved utility in applications. The Collection 5 MODIS NDVI data (MYD13Q1 and MOD13Q1 products) from the Aqua and Terra satellites were processed through the TSPT to remove clouds and otherwise clean and filter the time series temporally. The TSPT software enables the merging of MODIS Aqua and Terra data collected on a given day, which maximizes quality data retention. The TSPT version 2.0 is a MATLAB-based software application that computes and displays high-quality vegetation and environmental monitoring indices from high temporal revisit rate MODIS and other satellite sensors. The original purpose of the TSPT was to fuse MODIS Terra and Aqua products to improve the temporal interpolation and filtering of time series affected by clouds. TSPT provides single-timeframe and multi-temporal change images as time-series plots at a selected location, or as temporally processed image videos (McKellip et al., 2014; Prados et al., 2006). The MOD13Q1 and MYD13Q1 products were obtained from the NASA EOSDIS Land Processes Distributed Active Archive Center (LP DAAC), USGS/Earth Resources Observation and Science (EROS) Center, Sioux Falls, South Dakota, [https://lpdaac.usgs.gov/tools/data_access]. Land Processes Distributed Active Archive Center (LP DAAC). 2015. MODIS NDVI / EVI (MOD13Q1 and MYD13Q1) Products. NASA EOSDIS Land Processes Distributed Active Archive Center (LP DAAC), USGS/Earth Resources Observation and Science (EROS) Center, Sioux Falls, South Dakota, [https://lpdaac.usgs.gov/tools/data_access]. McKellip, R.D., J.P. Spruce, J.C. Smoot, G.E. Gasser, R.E. Ryan, K. Holekamp, and K.W. Ross. 2014. Time Series Product Tool (TSPT) Version 2.0, NASA Tech Briefs, 38 (11): 68, http://www.techbriefs.com/component/content/article/ntb/tech-briefs/information-sciences/20965 (accessed 12/17/2015). McKellip, R.D., K.W. Ross, J.P. Spruce, J.C. Smoot, R.E. Ryan, G.E. Gasser, D.L. Prados, and R.D. Vaughan, 2010. Phenological Parameters Estimation Tool, NASA Tech Briefs, 34(9): 36-37, http://www.techbriefs.com/component/content/article/ntb/tech-briefs/software/8481 (accessed 12/17/2015). Prados, D.L., R.E. Ryan, and K.W. Ross, 2006. Remote Sensing Time Series Product Tool, American Geophysical Union, Fall Meeting 2006, abstract #IN33B-1341, http://adsabs.harvard.edu/abs/2006AGUFMIN33B1341P (accessed 12/17/2015). This data set was initially published on December 12, 2015. A data file (MCD13.A2014.unaccum.nc) containing Collection 5 MODIS NDVI data for calendar year 2014 was added to this data set on March 24, 2016, extending the data set by one year to total 15 years of data. However, we noticed that there were zero values for 8-day periods at the end of the year for many MODIS cells in the data for the year 2014. To correct this error, on Nov 17, 2016, MCD13.A2014.unaccum.nc was replaced with an updated data file, which is complete in all locations where TSPT interpolation was possible. In addition, data file for calendar year 2015 (MCD13.A2015.unaccum.nc) was added to this data set, thus extending data set by another year to total 16 years of data. These two files, MCD13.A2014.unaccum.nc and MCD13.A2015.unaccum.nc, are identical in format to the other files within this data set.